Consider this a friendly public service announcement. It’s smoothie season, everyone. As the weather warms up and the snow dwindles, making way for occasional April showers, smoothies go back on the regular rotation in our home and in homes everywhere. Inexplicably, our internal clocks make a switch and we begin to crave more fresh fruit and vegetables, cold, refreshing drinks, and things that feel both quick and healthy as our lives get busier. All of a sudden smoothie recipes that I wrote years ago start popping up in web searches, on social media, and in conversations around town with readers. The green smoothie I’m featuring today has only four ingredients and is a new favorite around our house this spring. If four ingredients wasn’t easy enough, I often already have these items on hand: ripe bananas, vanilla Greek yogurt, orange juice, and fresh spinach. Adding spinach to your smoothies is a great way to incorporate more fresh greens into your diet. The great thing about it is that you don’t even taste the spinach. Instead you get this beautiful green color and all those nutrients without any of the flavor. It’s also a great way to get your kids to eat spinach, especially if they refuse to otherwise. Good Greek yogurt packs a protein punch and helps you feel fuller longer, but not all Greek yogurts are created equal. If more protein is important to you, be sure to check the grams of protein per serving in the supermarket’s Greek yogurt offerings. You may be surprised to see that they vary quite a bit. In my experience, the pricier options have the most protein in the bunch, and may be worth the investment if protein is what you’re going for. Serves 2. Recipe by Maya Wilson. 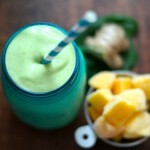 Place the bananas, vanilla Greek yogurt, spinach leaves, and orange juice into a blender. Add three ice cubes. Place the lid on your blender and whirl until smooth. Pour into two glasses and serve promptly.